outside Wat Thammarattanaram in Broussard, LA where 118+ Lao and Cambodian Evacuees from New Orleans are seeking refuge from Katrina's devastation. 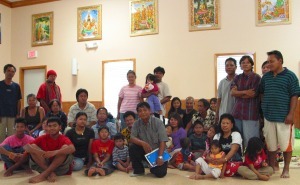 Over the weeks of September 9-18, 2005, the Elgin and Rockford Lao communities came together to assemble food and necessitities to deliver to Louisiana where a group of 118+ Lao and Cambodian evacuees from Hurrican Katrina are gathered, living at the temple in Broussard, LA west of Baton Rouge. Their future is quite uncertain, and they're now most in need of hope, and funds to help in rebuilding their lives. The Cambodian evacuees there are in particular need of hope as they have not been visited by any Cambodian groups from outside of the area. Many of the evacuees are from the "bottom of the bowl" at the lowest point in New Orleans, and made their living as shrimpers. With their boats destroyed and not having the funds to insure their shrimp boats, they are not at all certain where the next step will be. Loading/prep of the vans in Rockford, IL and Elgin, IL! 9/19/2005 See Doc H's photos of the trip. Many more photos to come! Greetings to Doc H's class who forgave his Friday absence and let him join us! 9/18/2005 9:00pm: We're back, after an overnight stay near Memphis last night, and a stop in St. Louis today for lunch. We'd like to thank the community for your thoughts and prayers for our safe travel, and for the warm welcome back at Wat Lao Buddha Samaggi in Elgin! The trip was a fantastic success and all efforts were greatly appreciated. Photos coming tomorrow! 9/17/2005 8:00pm: The group is on their way back home with many stories to tell of the brave, warm and wonderful folks they met. 9/16 9:30pm: The group has arrived safely at the temple in Louisiana! They braved a terrible storm, and a 9 car pileup to get there, (and wisely stayed overnight near St. Louis to get some sleep) but they made it! 9/15 9:30pm: Gassed up, 2 vans with the gang headed south on I-55 and on the way to Louisiana! Thank you to Samane for his generous cash donation that paid for the 2nd van and a substantial portion of the lodging for the overnight trips down/back, as well as Ms. Thonglouane and Ajan Phone Khoxayo for their generous personal donations to help w/the trip expenses! Thanks also to our group that brought you Elgin Lao Culture Night, for their donation which covered our fuel expenses for both vans! Thanks Lily for the delicious lunch! 9/14: See the new photos of the loading/prep of the vans!! Thank you to Rockford community for their extremely generous donation to the evacuees as well as their donation to offset the travel expenses! Thank you to Nadda and Brian of Thai Spice in Aurora IL for their generous food donation! 9/14/2005 11am: We have secured a low-cost rental van from Enterprise Rent-a-Car in Elgin that Phet/Todd will cover! Thank you to Enterprise for your generous discount! Phet, Nor S., Vivian O., Kip T, and Dr. H. from NIU are slated to make the trip, and the caravan leaves Thursday night! Imagine losing everything that you had, everything you'd worked all your life for. Imagine being displaced from your home and losing everything not once but TWO times in your lifetime! And the worst part is you don't know what the future will bring. 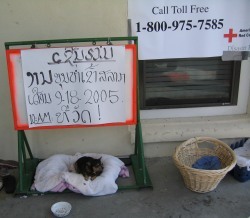 It took our family and most Lao families in America 10-15 years to save enough money to buy a house! It's heartbreaking to know that these people are going to have to start all over again. As I'm sitting here in the comfort of my home typing this email to you I can't help but think about the less fortunate, survivors of Hurricane Katrina. Before seeing Lily's email yesterday Todd and I had discussed about how we're going to help the survivors in general . I was not aware of the Lao, Cambodian and Vietnamese survivors who are taking a temporary refuge in Wat Thammarattanaram in New Iberia, LA. I went online and found a contact then I called and spoke with the man who's in charge in helping the evacuees. I found out that there are around 112 people there currently. More might be heading there in the near future. About 50% of them are children. Twelve children have been enrolled at a grade school and three university students at a nearby university. 9:00AM - 7:00PM or call for after hours drop off. Mr. Em Ramangkoun and the board members of Wat Lao Buddha Samaggi of Elgin (on King Arthur Court) have voted to send a generous donation $1,000 to Wat Thammarattanaram in New Iberia, LA today as a start. 3. Another fundraising event hosted by the Lao American Organization of Elgin and other organizations in Illinois is in the works. Check www.phet.org in a week or so for details. 5. *Money:* for those of you who like to take action now or are not in the Elgin, IL area you can send a check directly to the temple at the address below. Make your check payable to Wat Thammarattanaram. In the memo write " Evacuees of Hurricane Katrina." The temple has established an account at a local bank for the evacuees. I'm sure they'll appreciate every penny to help with the expenses!